Every year I try to do a character costume. I love the reactions I get when people see something they remember from their past. This year I went with a character that haunted my childhood, Judge Doom. The costume didn’t require much for materials. All I needed was two ping pong balls, bald cap, cotton spider web, cape jacket, and some black fabric. I wasn’t able to find a bow tie as thin as the one from the movie. So I created a bow tie out of the black fabric and attached it with a safety pin. 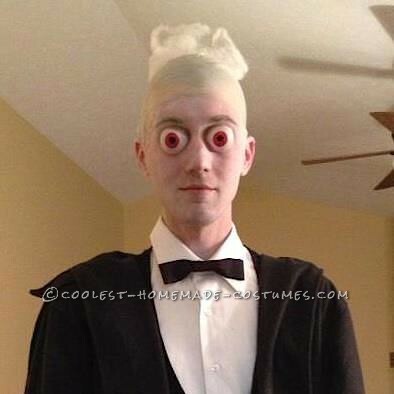 The eyeballs were the hardest part of the costume. I used a grinder to shape the ping pong balls to fit around my eyes. I drilled 1/4 inch holes to see through. In order to make the eyes look as real as possible I decided to glue them on with spirit gum. I lost all peripheral vision but it was worth it. I used the cotton spider web for the hair. It’s light enough that it could be shaped to stick up and it would hold it’s shape for quite a while. A little white makeup to help blend in the bald cap and make myself look pale and I was set to go. My favorite costumes are ones that other people enjoy. I’ve created more complex costumes, better looking costumes, but this is one that was really fun and I’ve never seen it done before.